In January, I traveled to Quintana Roo, Mexico to see CAMY Fund grantee partner Elige: Red de Jóvenes por los Derechos Sexuales y Reproductivos in action. 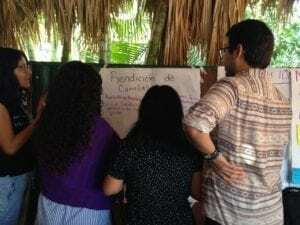 The pretext was a training that Elige convened for organizations that form part of the Quintana Roo Network for Youth Sexual and Reproductive Rights, of which they are a founding member. 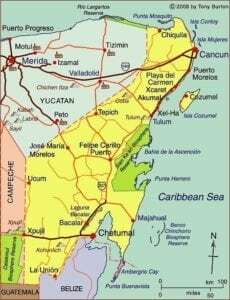 Quintana Roo had elections last year and a coalition government between the conservative and liberal parties (PAN-PRD) won. The elections were historic since this was the first time since the founding of the state in 1974 that the centrist PRI party (which currently holds the Mexican presidency) lost. As part of the CAMY Fund’s informed grantmaking model I decided to take advantage of the trip to meet with officials from several public institutions to hear their reflections about the elections and what the new government would mean for young people in Quintana Roo. Central to the CAMY Fund philosophy is that we must understand politics and key actors’ motivations so that our grantmaking and technical assistance is relevant and strategic. My first meeting was with Claudette González, Technical Undersecretary for the state’s Ministry of the Interior. Claudette, CAMY Fund Fellow, Didier Tuz, and I discussed the formation and next steps for the State Group for the Prevention of Adolescent Pregnancy (GEPEA by its initials in Spanish), which coordinates implementation at the local level for the National Strategy to Prevent Adolescent Pregnancy. Elige, the CAMY Fund’s grantee partner, was one of the organizations that pushed for the formation of the GEPEA based on its participation in the corresponding group at the national level. The success of this strategy was confirmed by Claudette who said, “the GEPEA was formed last year because of the pressure from civil society organizations.” Claudette expressed some concern about the mandate of the Group and its operations, which Elige is particularly poised to respond to, since they have the perspective of the national group as a reference. Inaugural ceremony for the installation of the GEPEA. 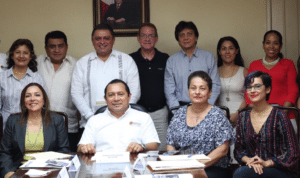 CAMY project leader, Mayra Zamaniego at bottom right. Our next stop was to visit with Norma Salazar, the new Executive Secretary of the State System for the Protection of Children and Adolescents (SIPINNA by its initials in Spanish). The SIPPINA is a result of 2015 legal reforms based on the passage of the General Law for the Rights of Children and Adolescents. There are equivalent systems at the municipal and federal levels to coordinate efforts between government institutions in favor of the rights of children and adolescents. Further information about this system can be found here. My interest in this meeting was to find out more about how child marriage/early unions were addressed in the State Protection System. 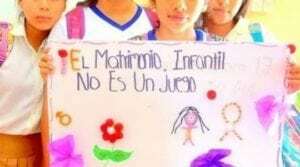 Though the minimum age of marriage in Quintana Roo was raised to 18 in 2014, historically the statewide percentage for adolescent girls (ages 15-19) marrying or entering early unions has hovered around 23 percent. Norma informed us that “there is no current strategy around early unions,” however she expressed a commitment to incorporate this issue in the work of the SIPINNA. This lack of a state-wide strategy to address child marriage/early unions, combined with the commitment of the Executive Secretary to address the problem, presents an opportunity for CAMY Fund grantees to guide the orientation of the local government’s approach. The last meeting before heading to Elige’s training in the municipality of Carrillo Puerto was with Dr. Christian Rueda Jiménez, in charge of family planning and adolescent sexual and reproductive health at the Ministry of Health. Dr. Rueda has overseen the expansion of youth-friendly services throughout the state over the past year to a total of 28 to date. When discussing sexual and reproductive health needs in the state, he cited the need for teacher education as one of the key issues. This particularly resonated with me because the CAMY Fund is also interested in supporting comprehensive sexuality education in schools, which often begins with teacher training. These meetings with public officials were extremely informative for the CAMY Fund. I came away from the meetings optimistic about the opportunities that this new government presents and with clear ideas on how to target our grantmaking in order to have the most impact. Network participants discuss the definition of Accountability. Following these meetings, we headed to the municipality of Carrillo Puerto to observe a training with members of the Quintana Roo Network for Youth Sexual and Reproductive Rights. The Network was formed in late-2016 as a result of Elige’s convening work in the state. Since then, they have organized a series of trainings to strengthen members’ knowledge and skills in anticipation of a joint advocacy plan in 2017. Thirteen organizations from all over the state attended the training which was dedicated to conceptual elements of advocacy and communication strategies. Being present for the workshop allowed me to get to know individual organizations and also observe the network’s dynamic as a whole. I was also able to identify talented leaders representing organizations new to the CAMY Fund. I left this trip excited about the work of our grantee partner in Quintana Roo, and hopeful about the potential for institutional changes in the state. As a grantmaker, I feel empowered by the relationships I strengthened and information I collected, all of which will inform our strategy moving forward. ENADID 2009: Distribución porcentual de las mujeres de 15-49 años según condición de unión para cada entidad federativa y grupos de edad. Pg. 142.